On Monday morning, our little group took a brief excursion to see some standing stones. We hopped a stone-and-barbed-wire fence — some of us more gracefully than others — and trudged out to the middle of the field. One moment we were inspecting and photographing these amazing menhirs, and the next we were briskly approached by a small herd of horses. I was a bit bemused, so I only had the sense to take one shot before they wandered off again. 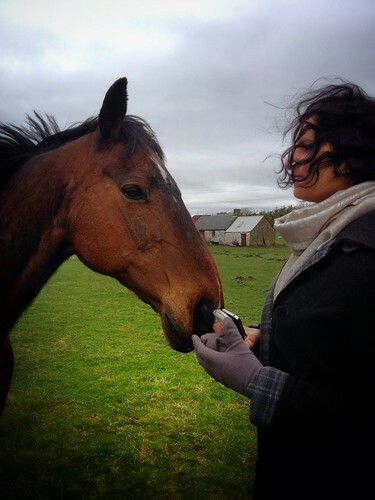 Here Azra is inspected while trying to keep her phone out of the horse’s snuffling path. Azra took this amazing shot of FunkyPlaid with two of the herd. Please observe the phone-snuffling! O, and the standing stones behind him. As soon as the horses had determined that we were largely inedible yet inoffensive, they wandered off again. Moments like this seem to be commonplace in this country. I hope I never get used to them. Aside from a visit to Stonehenge many years ago, I have almost no background on standing stones yet. Further research is in progress. For your own interest, FunkyPlaid recommends the writing of Richard Bradley. Also, The Megalithic Portal looks like a good resource for photos and locations. Although it is a myth that Scotland does not have any trespass laws, people are legally able to cross land and water as long as it is done responsibly. More details about these access rights and the Land Reform (Scotland) Act 2003 are listed on the Scottish Outdoor Access Code site. ‹ PreviousThat birthday lip dub again.